Kyle and I arrived at the Arches National Park backcountry desk just as they were opening at 7:30am. We were about the sixth in line and we received permits 43 and 44 out of 50; six more people ahead of us and we would have been looking for an alternate adventure. But it was mother’s day weekend and all of the camping around Moab had been full the night before, so the fact that this will known beginner-friendly adventure was almost sold out was hardly a surprise. We paid six dollars each for our hiking permit, topped off our water and drove the 10 miles to the trailhead. The fiery furnace is the name given to a small section of Arches National Park where a series of parallel sandstone fins forms a life size maze roughly a half a square mile in area. Young and old alike wander in to spend hours exploring narrow passageways, looking for breaks in the towering walls that will allow them passage to deeper levels of the labyrinth. The only thing missing is David Bowie. Despite the name, which is derived from the maze color’s resemblence to the that of an active furnace, the Fiery Furnace is a bit of a desert oasis: flora like juniper and poison ivy abound, as do the smaller fauna, birds and lizards, and much of your hike is spent in the cool shadows and even the dark recesses between towering fins. From the parking lot we headed north first, eventually finding our way out onto open sandy desert where we headed toward the western edge of the maze. We attempted to head back south down myriad parallel valleys but continuously found ourselves “cliffed-out”. Twice we encountered webbing and rappel ring anchors which gave rise to us questioning the logic in our decision not to bring full canyoneering gear (and pull the accompanying permit.) Once we even descended a convoluted slot by down-stemming some 75′ to reach a disappointing conclusion: this would be an ideal place to rig a chokestone anchor and rappel free-hanging out a hole in canyon bottom, had we had the foresight to add webbing, harness and a belay device to the rope we were carrying in case of emergency. As it stood our only choice was to stem back up and out of the dark and sandy slot, which we quickly did to escape our disappointment. Then we laid on the rocks there at the head snacking and talking. After gaining several fins to get a lay of the land and to practice forearm stands and take pictures flanked by the snowy La Sals, we made several simple (class 3) downclimbs and one class 5 stem of about 8′ to reach the lowest part of the Fiery Furnace. We began to spy other visitors who had started in the lower part in an attempt to do the opposite of us: work their way through to the top. As far as I can tell this requires some technical climbing. We did not attempt to navigate back to the west to get a look at the bottom of the three rappels we had seen earlier. Instead, we returned to the car feeling satisfied with our four-hour adventure, successful in having passed through the Fiery Furnace end to end, though admittedly much of this time was spent backtracking. There, I sat on the sidewalk cooking us eggs and toast in the unsettled May overcast as the tour returned and visitors young and old smiled at me, the content desert rat, as they dissipated back to their cars. We soon dissipated too, leaving the park and opting for the scenic drive up 128 to return to Colorado. Bikerpelli was going on and I excitedly jabbered to Kyle about what it’s like to spend 3 days mountain biking 150 miles thorough the Colorado’s rocky river benches into Utah’s high desert and finally over a shoulder of the La Sals to finish out with the most epic 26 miles of downhill mountain biking ever to grace God’s green earth, the Porcupine Rim, all the while being fully supported with food, beer and your camping gear. (It’s a good time.) My jabbering was derailed when we saw two guys gawking at dark mineral-stained slabs of toppled sandstone high on a hillside above the biway. “That can only mean one thing,” I thought, and I had Kyle turn around. Sure enough, there were Fremont and Anasazi petroglyphs chipped onto two sides of a square black boulder, a veritable roadside billboard for the ancients. We got a good look and then finished out the last few miles of our scenic drive up the Colorado River gorge to discover billowing dust blotting out the modern day billboards of the I-70 corridor. Sustained northerly winds peeled dirt and plants from the ground. Greenery tore up and tumbled across the highway. Orange constriction barrels blew over and rolled across the lanes they were not supposed to impede, and we watched a portable electronic sign detailing the closure blow off the shoulder and into a ditch, probably incurring severe damage in the process. Dirt streamed from the hillsides and was carried away in a life-size diarama of fluvial erosion. Kyle frowned as the dirt pelted his new car’s paint. We woke to cool overcast. Expecting sweltering sun, we had toyed with the idea of leaving behind our wetsuits, which was my idea. Actually, being a minimalist I had suggested that we leave the rappelling gear too. All this despite the three prescribed rappels and four lengthy swims in Cheesebox Canyon. Camping abounds on the Cheesebox Road and we were able to camp at the head of a small tributary of Cheesebox Canyon, 10.9 miles from Soldier Crossing and the highway. We entered the canyon there with wetsuits, rappelling gear and 60′ of rope. A serious of simple but brushy downclimbs over half a mile brings you to the canyon bottom and your first slot. You’re in the water immediately and wetsuits are unequivocally welcome at 75°F and cloudy. The rappels happen close together and are not into water. #1 is downclimbable, as is #3. This blogger did not have the stomach to risk downclimbing #2, though I surmise it is possible despite the slick and wet walls, which would obviate the need for rappelling gear completely. Rappel #3 does not look immediately downclimbable but there is a passage through the boulder jam that makes it possible and in fact easy. To rappel this would require at least 70′ of rope. The swims are just that – lengthy bottomless pools – and there are 4 in all. The last one, a “swim slot” as author Michael Kelsey badges it, is bypassable with careful stemming. The exit is a quarter mile passed this swim and puts you back on the Cheesebox Road about 3 miles from where you entered. Finally. I’m back. This time with Kyle Hurd. We’re back. Feels amazing. Invigorating. Relaxing. True. Woke up looking down on the Fry Canyon Ruins for the first time since 2014 with Beth. Seems it’s a place I come to once each year when I can. Took a very leisurely start to the day, playing harmonica and drinking tea. Packed up and drove 10 miles down to the trailhead. The Black Hole is a riot IF YOU HAVE A GOOD WETSUIT. In a passable wetsuit it is doable but not so much enjoyable. Kyle was markedly cold before the swims were over in his 2/3 surfing wetsuit, and I was comfortable but not interested in any more swimming without first warming up in my tri suit. Luckily all of the swimming cones back to back, so it’s easytoo justkeep going. After the first three you want more and your sure you won’t get enough. By the fourth (the best, go down earlier not later, “the bunny grotto” as Kyle called it, long story) you’re loving it and you’ll be so glad you have your wetsuit and can hang out. How quickly awe dissipates. By the fifth swim you’re dealing with some heavy conditions – slithering through a log jam and moving through 30′ of log soup – and you’re starting to realize how cold you are and that you don’t know how long the obstacles go on for but it could be a long time. You start to think back to that sign at the beginning of the canyon that says that experienced canyoneers say that safe descent is impossible and you really hope that it’s wrong and you push forward and when you get out of that pool without getting crushed by the logs above you or ensnared by the logs below the water you’re thanking you’re lucky stars. And then you have another long narrow swim. And another, and you’re in and our odd the water a few more times not knowing how deep or will get and you’re doing it just to get through it and take a break and then gleefully not walk or wade or swim or have to even think about muddy water where you can’t see the bottom anymore. And eventually you get there. But the point is you WILL get enough water in the Black Hole. Timing is key, we walked a little faster than average and were in nice sun by the very last swim, having left the trailhead at about 11am. Then, we had a hot but not sweltering May jaunt back up the blacktop to the car at 4pm, a 5 hour roundtrip. Excellent. Dry bagged music – that is a lightweight speaker and mp3 player in a MAC sack – was a blessing and really helped to set the mood when we were downing waterfalls and swimming through caves, and then to keep us positive when the soup got thick. We got in the car and finally located Soldiers Crossing, passing it twice in the process, then creeped up the Cheesebox Road at 10 miles an hour to a campsite near the head of Cheesebox Canyon, some 11 miles in. We grilled filet mignon that I picked up and had seasoned in Glenwood Springs. The stars were good, but they were much better and I was able to observe a couple of fireballs in the predawn hour, having set an alarm. It was a prelude: the Eta-Aquarid meteor shower peaks tomorrow night. Packed late the night before, then got up today at 6. Hit the road to Summit County, was plenty early for my 9am appointment and dipped out early. Picked up the necessary gear at Allan’s and by 2pm Kyle found me in the park about to do some yoga. Gorgeous air-conditioned drive west and the evening found us stopping to take pictures of vistas and pictographs and petroglyphs and Lake Powell. We were ecstatic to find the Fry Canyon overlook unoccupied. Or at least I was. I let Kyle discover the ruins in the morning. Frogs ceaselessly bellowed from the canyon bottom, filling the starry night with an eerie bustling chatter that was palpable in every void, including the gaping canyon between us and them and the gulf that lies between all of us and the stars. This would be a prelude to the playful amphibians that would dot the walls and peer down at us from the alcoves during tomorrow’s adventure. We grilled bratwurst and slouched in our camp chairs as we identified constellations in the moonless dark. We had come here in part because the peak of the Eta-Aquarids meteor shower coincided with the new moon almost to the minute, so our night-one mission was simple: locate the shower’s radiant (Aquarius) so that we’d know where the meteors would be coming from two days hence. There’s really not much to this canyon. An advanced canyoneer who enjoys climbing and a full day adventure would likely prefer to descend the Main (East) Fork of Three and exit via the three upclimbs in the Northwest Fork. If they’re too difficult or the exposure proves unmanageable there’s always the prescribed exit route near the bottom of the fork, which, incidentally, is itself very exposed. Another alternative route would be to do the North Fork (which this author has not explored) and the Northwest Fork in the same day, with perhaps a jaunt along the green in either direction, or up and back down East Three. Allan and I parked nearby and were in the canyon in less than 10 minutes. The first rappel is obviously downclimable and we mistook it for such. R2 is intimidating due to its height, a sold 65 vertical feet, and so I did it with a top belay. The canyon’s lower pouroffs are easily identified by a righthand (western) bypass trail, again very exposed. We turned around above these, realizing we’d completed the canyons interesting parts, though I suspect that the section below the pouroffs is lush and beautiful, seeing as Three’s lower main fork is said to have perennial flowing water and this is where the Northwest Fork joins it. I free soloed both rappels and assisted Allan with a top belay on each using a 9mm static line, a grigri and two locking biners; both raps already had wrql anchors around chokestones. The risk of a big fall is minimal because neither rappel is vertical. You could, however, slide deeply into the back of either crack, making restarting your climb difficult as both cracks are too narrow there. The drive to Green River was less than 30 minutes, and Ray’s Tavern turned out two mediocre burgers like usual. One of the most beautiful canyons this author has had the pleasure of exploring in 60+ canyons over 5 years. We parked at the Pinon Juniper campsite in Kelsey’s book and did the lower half first; it’s a short and easy hike in (and out at the end of the upper half.) The rappel at the very end really is only about 80 feet, despite looking twice that height from the top. The start is awkward and nerve racking and most of the rappel is free-hanging, thus turning an otherwise beginner-friendly canyon into something solely for those with iron constitutions. Allan was pretty shaken at the bottom. There is also a serious downclimb a little ways before that that looks impossible until you begin the descent and see the great holds around the corner. Above that is a larger natural bridge in a section of slot with beautiful colors and stripes, fins and chutes. It’s a 2.5 mile road walk back the way you drove in from the PJ campsite to the parking spot at the top of the canyon, exactly at the Deadman Trail and Spur Rd junction, and from there your best bet is to follow the established trail to the southernmost entrance; that is, the furthest entrance. This way you get to see the colorful slot there, which you can miss by going into the two closer entries. There is a 2m slide/drop that left my lower legs buzzing and would likely prevent ascending this upper half of the canyon, although experienced climbers might do it with a daring stem maneuver . There is a very good upclimb in a side canyon at a big 4-way junction shortly before the 2m drop, and I want to take Allan back to try it. All in all, this canyon is a walk-through. It would be an ideal place for an advanced beginner. The upper half is interesting, fun and imminently doable, while the lower half provides a couple of challenging downclimbs (which could all be rigged for rappel; they already have webbing and quicklinks) and a scary but not-dangerous rappel that can be escaped by retreating up canyon to the halfway point entrance in the event it’s too much. It’s beautiful and fun, the only barrier is getting they’re – it’s about as remote as you can get in Robbers Roost; 4×4 and extra gas is required for all but the most careful and patient explorers. Currently our favorite spur canyon. Easy road access. Ibis hook helpful but not necessary. Several hairy downclimbs that were already rigged with webbing and rapide. We took one 80 foot rope, long enough for all but the final rappel, which is 150-200 ft and so would require a long rope and pull cord. We carried ascending gear but the number and complexity of downclimbs would have made it a grueling chore to go back up. As it turns out there is an easy exit just above the last rappel and after the last slot and wade. We suspect there is a possible escape below R6 on the right/east, but if there’s not then??? Much prettier and challenging than Low Spur, which we did this morning. All in all the road out here, the Spur Road, is rough and requires 4×4 and oversize tires, extra water and gas, and significant patience. The “unused track” that Kelsey describes is not there and we walked all the way to the road on our return to the truck. Done as a down and back, with significant difficult upclimbing. One could save an hour by skipping the 2nd to last rappel and downclimb; this nerve racking DC only serves to give you a look at the lower canyon as it opens up, and you’re downclimbing down a crack that slowly rolls off and spits you out, only to return when you can no longer stomach the exposure. Or, you could take a 200′? rope and do the last rappel, then walk to the confluence with Horseshoe Canyon and ascend or for 3 or so miles to exit via the old Phillips Oil Co road or to a car spot at Horseshoe Canyons West Trailhead. Very short slots, the upper is better with a twisting corkscrew descent, no headlight necessary. Dont let this canyons proximity to Twin Coral and Larry canyons fool – it’s no epic adventure. In fact, I fully expect to forget about it soon, and leave it out of the guidebook. That said, it has a fork I did not explore (the South Fork) and a small tributary to the North Fork that I did explore (South Branch) that we only saw the very bottom of as part of our exit route. The highlight of this technical decent is the complicated and downright scary final rappel. The most noteworthy part is the grueling hike out. We followed Michael Kelsey’s beta (map 21 in Hiking and Exploring Utahs Henry Mountains and Robbers Roost) to the recommended parking area at 1664m and rappelled into the head of the North Fork just a stones throw from the truck, literally. The canyon was mostly open walking, especially at first. No significant stemming was needed, although we made several down climbs, some of which required a small jump at the end. Rappel 4 was notable in that despite looking necessary on-sight we quickly realized a downclimb was possible, so we free soloed it in both directions to make sure. It was. The other rappels and even the slot sections were forgettable, save for rap 6, although rap 5 to the rap 6 stance was a twisting drain set off by a massive chokestone blocking the slot, a decent reminiscent, albeit much smaller, than the final Pine Creek rappel in Zion. Rap 6 is big (our rope plus a length of webbing attached to the pull side, about 240′ in all) and took several adjustments to get set up correctly. Deployment is complicated by a slick narrow slot and an abject inability to see the ground. I’d suggest marking your rope ahead of time and double checking everything before you deploy your ropes; we biner-blocked the wrong side of the rope and I had to tie off and switch ropes mid-rappel when u came to the webbing that we’d tied on as an extension so that the pull side of our 200′ Canyon Fire would reach the ground. The cattle trail exit is unclear – it actually leaves up a side drainage, and several hundred feet must be gained and then relinquished on your meandering climb to the rim. The adventure: A backcountry trek that requires route finding, boulder hopping and bushwhacking, and offers up water filled narrows, spring fed swimming holes, rope swings and cliff jumps for the daring. There are also at least 2 ruin sites hidden along the western walls of Wet Beaver Canyon. Know before you go: The majority of the mandatory swims on this hike are in the bottom half of Wet Beaver Canyon, so plan most of a day to cover that 3.5 miles. Getting there: From Flagstaff drive south on I-17 and take exit 298 for Sedona. Turn left on FS 618 and drive eat 2.0 miles, then turn left onto FS 618A, which is signed for Beaver Creek Work Center, and immediately park at the trailhead. The hike: Head North on the Bell Trail #13 for 2.5 miles to the 2nd T intersection which is the Apache Maid Trail #15. You’ll retrace your steps from this intersection back to your car at the end of your trip. Turn left and climb to the mesa top on #15 to a sign that says further travel is not recommended. From this point on, #15 is a backcountry route marked with occasional wire bails filled with the abundant basalt ballast rocks or weathered 4×4 posts with the number 15 near the top. They’re hard to miss so if you go long without seeing a bail or post you’ve lost the route and should double back. You’re basically paralleling Wet Beaver canyon but it’s best to do this part of the hike using a GPS. After about 11.5 miles of hiking, trail #15 will pass through a cattle guard on a dirty road. Leave the trail and head east through the tall pines of Waldroup Park. Enter the shallow top of Waldrop Canyon at a National Forest Wilderness sign just East of Waldroup Place Tank where the drainage begins. 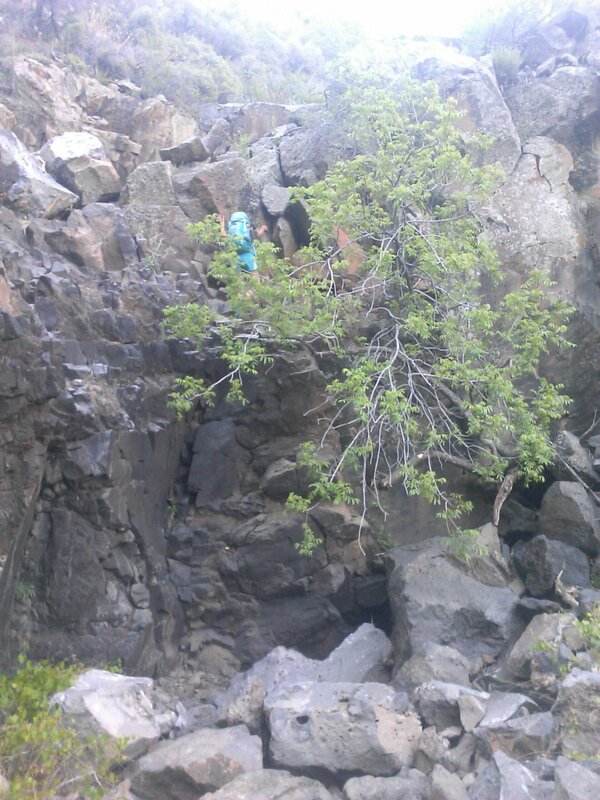 Descending Waldroup Canyon requires seven short class 5 downclimbs, mostly on juggy and grippy basalt. Those inexperienced in climbing with a pack will want a 20′ rope to lower there pack down to a partner. You’ll join Wet Beaver Creek just above the Coconino sandstone layer where things get interesting, that’s why you didn’t walk Apache Maid #15 to it’s end and then enter Wet Beaver from the very top, though you could if you were looking for extra miles. For now it’s a dry wash so head 1 mile down canyon to where springs begin to fill the canyon bottom. Filter your water here, then head back up canyon to camp on the accumulated sand and gravel, or sling a hammock up, just watch out for rising water. The next day, descend Wet Beaver by boulder hopping, backstroking with your pack on and wading, until you get to one of the last swimming holes, cliff jumpers heaven, recognizable by a 2×4-wrunged rope ladder tied to a wayward juniper on the west side. Camp near here at your own risk (camping is not permitted in the Wet Beaver Wilderness) but you’re probably pretty darn tired from today and despite the restrictive regulative campsites and people using them abound. The next day, jump, climb and sun yourself on the rocks till your hearts content, then continue a few minutes down canyon and climb out to the west on orange sandstone to find the Weir Trail running parallel to Beaver Creek. Follow this South, rejoining #13 and then shortly after coming to the T intersection where you left #13 on #15 two days before. Retrace your steps to the trailhead passing the White Mesa Trail along the way, then head to Montezuma’s Castle and Verde Hot Springs, both just with of here.